Today explore Dublin City. Highlights include Trinity College, Dublin Castle and St. Patrick’s Cathedral. 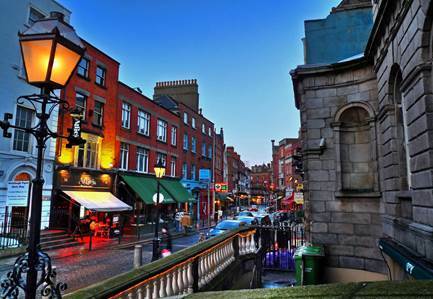 Stroll along Grafton Street, Dublin’s premier shopping area. The thoroughfares leading off Grafton St. bustle with fashionable restaurants and traditional pubs, where you may sample cuisine from around the world. Visit St. Stephen’s Green, Europe’s oldest and most beautiful Georgian Square. 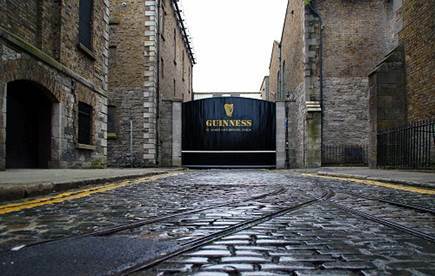 Perhaps fit in a visit to the Guinness Brewery at St. James’ Gate. Visit Speakers’ Square in Temple Bar. A day tour to Wicklow, the “Garden of Ireland,” is an option today. 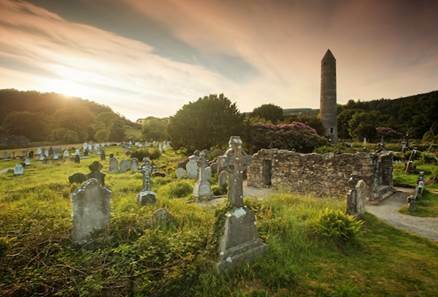 Explore one of the most famous and enchanting places in Ireland, Glendalough (the valley of the two lakes), home to some of Ireland’s oldest and most interesting monastic ruins. The spectacular hidden mountains and barren bog lands at Sally Gap will leave you breathless. Or if you prefer, explore Dublin’s galleries, museums, and gardens. Enjoy a lunch of oysters and Guinness at Davy Byrne’s, mentioned in Joyce’s book Ulysses. Depart Dublin this morning. Head south to visit Kilkenny, Ireland’s best example of a medieval town. It is beautifully situated on the river Nore, which forms the moat of Kilkenny’s magnificent, restored castle. You may take a guided historical walking tour to include St. Canices and Black Friary. Enjoy lunch at Kytlers Inn. 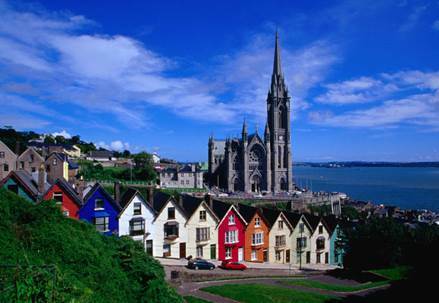 Tour Cork City and include a visit to the Shandon Bells, the gothic style University College, St Finbarr’s Cathedral, City Market and the Crawford Art Gallery. Perhaps head to Blarney to see the castle and kiss the famous stone of eloquence. Shop at the Blarney Woolen Mills. Visit the Titanic Exhibition at Cobh. Today tour the world famous Ring of Kerry. 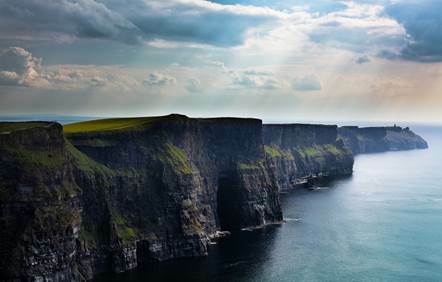 This trip promises some of the most celebrated scenic attractions in Ireland with rugged landscapes, antiquities and attractive villages. From Waterville you can see the Skellig Islands, once raided by the Vikings in 810 A. Continue along the ring to the lovely market town of Kenmare. Continue back to Killarney on one of the most scenic drives you will ever experience. Enjoy some traditional Irish music tonight at a local pub. Drive to the Gap of Dunloe, see Kate Kearney’s Cottage. Then visit the magnificent gardens and Killarney lakes at Muckross House and Gardens. Enjoy a great day exploring Galway City, known as the “City of the Tribes” since the time it was ruled by patrician families hundreds of years ago. 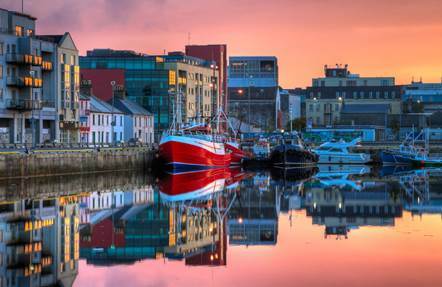 Galway is a thriving and bustling university city famous for the arts. Explore the many galleries and take in a theatre performance at the Druid. If you are in Galway in September, enjoy the festivities at the Galway International Oyster Festival. Transfer to Shannon Airport for your flight back to the U.S., or continue your tour of Ireland. Continue west into Connemara, the western region of County Galway, and one of Ireland’s gaeltacht (Irish speaking) regions. The area around Leenane and Cong is where the movie “The Quiet Man” was made with John Wayne and Maureen O’Hara. There are a number of charming fishing villages dotted along the coast where you may wish to stop for lunch. Visit Kylemore Abbey. After Breakfast, transfer to Shannon Airport for your flight back to the U.S. Confirmed Accommodations for 9 or 11 nights.